It was all started when I was invited to join a pilot project called UniBRIDGE Project in 2013. At that time, my English speaking skill was not as good as now. I joined the program with my friends and we used an online app Blackboard Collaborate (BBC) which is now replaced by ClickMeeting app. These two apps are easy to be used and have helped me a lot to speak to Australian students, help them with their Indonesian language learning, and learn English at the same time. We often discuss different topics, from current world issues until daily-life matters. I am really thankful to UniBRIDGE Project for helping to deepen and improve my English speaking skill and make me realize the importance of English itself as the world’s lingua franca. Before going to Australia, I had never imagined that I could go there. There was always a pessimistic question that popped up in my mind, saying “Are you sure you can go to Australia? Your English is not good at all!” Despite that, I still had the optimism to learn more until finally my friend Steven Parera and I were chosen as UniBRIDGE Project’s award recipients just a few months ago. At that time, I kept asking myself if it was real because I could not believe it. I told myself that my English was not that good and there were other students whose English was better than mine. But, my friends convinced me and I did not realize that there were tears of happiness streaming down my face. It was such an honor and a privilege for me and my friend Steven to have the chance to visit Australia for the very first time, representing our fellow UniBRIDGE Project students from East Nusa Tenggara who take part in the project. Extremely happy, that was what I felt when I stepped my foot on the Land Down Under. We went to four cities in Australia, Sydney, Darwin, Brisbane and Perth. From what I saw, each of these cities differs from one another in areas such as city layout, tourism, public transportation, weather, people and food. We did quite a lot of activities while in Australia like attending Bahasa Indonesia classes at some universities and senior high schools, meeting up with AIYA members, going for an interview at SBS Radio Australia, attending Indonesia’s Independence Day ceremony, meeting the Lord Mayor of Darwin, learning about dryland-farming systems and visiting different tourist sights and museums. Selfie with Ibu Richelle Hedstrom at night before going Brisbane. Having good relationship with Australian friends is one of the advantages I get from being active with UniBRIDGE Project. For instance, we had couples of old friends and new friends who helped us by providing accommodation while we were in Australia and we are really grateful for that. It is really meaningful to have a relationship with our friends from Australia who give all their hearts to help us and help us with things like accommodation. Especially when they let us come and stay in their home. Taking pictures with all the members of AIYA NT. Meeting AIYA members was a must for me. Why? That is because AIYA plays huge part in supporting UniBRIDGE Project. When we met AIYA members, we basically introduced and explained everything about UniBRIDGE Project to them like the advantages we get from the project and how AIYA members can also join the project. The atmosphere during the presentations was really good as expected, because everybody who came really welcomed us and they were like our old friends. Some of the AIYA members even came a long way from the meeting place, just to meet us. The promotion went very well and resulted with some of AIYA members registering themselves to join the project. Through this article, I personally want to thank everybody who attended the meetings. Attended the class of Bahasa Indonesia at the University of Sunshine Coast and doing some interviews with Ibu Rachel (left) and Ibu Beth (right). “When it comes to learning something, age is not a matter but we keep on learning till we die”. Such a wonderful time having dinner with Pak David Visser’s family. At Black Pitch Air Force Show, Darwin with Pak Nathan Franklin. Australia is not like what people in Indonesia think it is, especially for those who say things that are untrue. For example some Indonesians think that Australians are all rich so they like to spend lots of money irresponsibly. This often comes out from those who have never been to Australia. I just want to say that we often see Australian coming to Indonesia and using the money for holiday, but then they go back to Australia and get to be back to their normal daily routines like everyone in this world does, working and earning money so that they can travel to other countries and spend the money. Australians are truly workaholics. I like how Australians appreciate the time they have and make themselves helpful for others. That is what I felt while I was in Australia and I am glad to be a friend of Australians. During our stay in different Australian cities, there were a lot of interesting tourism destinations we visited such as the Sydney Opera House, the Harbour Bridge, the Royal Botanical Garden, Manly Beach, The Rocks, Black Pitch Air Show, Darwin Botanical Garden, Casuarina Square, Nightcliff Jetty, Museum and Art Gallery of the Northern Territory, Adelaide River War Cemetery, Darwin Waterfront, Australia Zoo, Noosa National Park, Hell’s Gate, ANZAC Monument Park, Perth CBD, Western Australia Maritime Museum, Swan Valley, Margaret River Chocolate Factory, City of Fremantle, Fremantle Market, Subiaco Sunday Market and Araluen Botanical Garden. We also visited some famous universities in Australia like the University of Sydney, Charles Darwin University, the University of Queensland, QUT, and the University of Western Australia. Don’t worry about the food in Australia. There are different types of food from all around the world that you can eat in Australia. Before going to Australia, I thought that the food I was going to eat would be in small portions but in fact, my tummy was always full every time after I ate something, sometimes I could not even finish eating. Anyway, have you ever tasted crocodile meat, kangaroo meat, camel sausage, emu meat, barramundi fish and lamb meat? My friend Steven and I already tasted all of them when we had BBQ time with our Australian friends. So delicious! 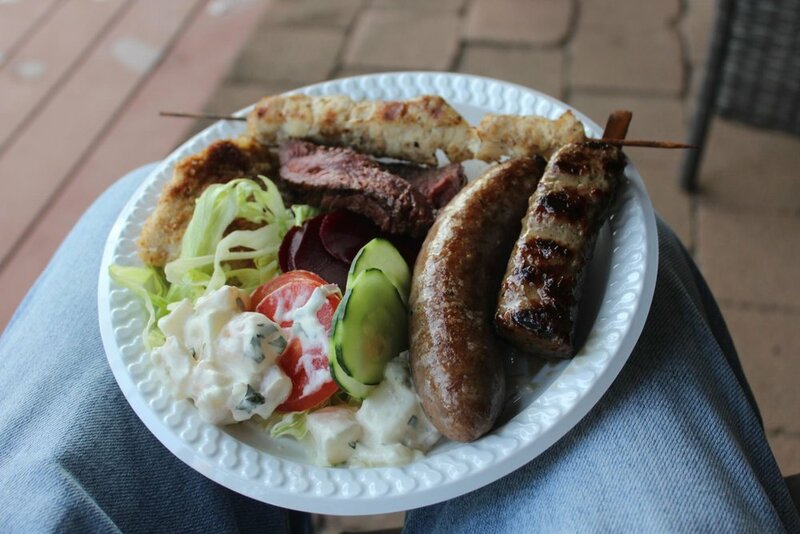 At this this barbecue there is crocodile meat, kangaroo meat, emu meat, camel sausage, goat meat and some vegetables. So, what are you waiting for? UniBRIDGE Project helps everyone who wants to grab the chance to learn English, visit Australia and meet people from far off places. Moreover, there are scholarships that you can apply to continue your study in Australia. Let’s be friends with Australians! Taking picture with Pak Peter Bekkers, he is the owner farm that we attended. We were shown how to manage and use the water during the dry season. Doing some small talk about UniBRIDGE Project with members of AIYA QLD and pizza dinner in Sunshine Coast Surfing Club. Taking picture with the teacher Bapak Grant Christie and student of Casuarina Senior Collage when already finished the class of Bahasa Indonesia in Casuarina, Darwin. Taking picture with the teacher Ibu Sharon Punter and student of John’s Collage when already finished the class of Bahasa Indonesia in Nambour, Sunshine Coast. Taking picture at the library with the student of John’s Collage when they showing around of the school to us. Taking picture with Ibu Endah Curtis, Amy Della-Torre, Mandula Barta and some guy in International Food Festival, USC. Taking picture with Ibu Beth Kracke in her kitchen.